Oblivious of the well-known fairy tale, young Barack sells the family cow for a handful of beans and gets into deep water. Who is the Giant? What gets laid by his precious hen? This is a musical romp that goes all the way to America’s near-bankruptcy, accompanied by a mad hatter’s Tea Party of assorted bankers, lawyers and politicians. Great tunes and nifty words. 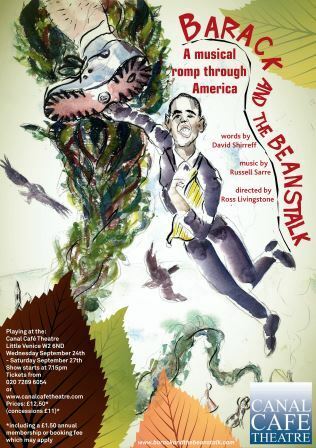 Barack and the Beanstalk is the third in a row by the Shirreff/Sarre team, all of which began life at the OSO Arts Centre in Barnes, London.